I choose to title this piece Rorschach Moon as I created the foreground moon as a deliberate attempt to call to mind the bilateral symmetry typically seen in Rorschach tests. The original working title for this piece was Putting It All Together because the various elements were first created individually and simultaneously. The first component was an experiment with a different way to create layered star fields. The second component was experimenting with the creation of the nebula and large foreground stars. For the nebula I opted to use a palette of pastel colors to create a nebula that was evenly, yet randomly distributed throughout the picture. 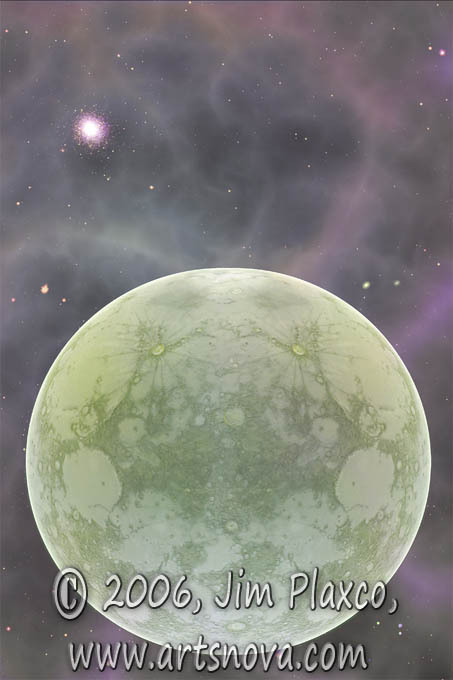 The third component was the foreground moon-like world with its strong, but not perfect, bilateral symmetry. Pastel colors were also used to create the moon.